If you’ve ever tried trudging your way through thigh deep snow, you’re probably well aware how useful snowshoes are, even if you’ve never tried a pair on. Not only are snowshoes a great way to stay on top of deep snow instead of being buried in it, but snowshoeing has become a pretty popular winter sport for people of all ages. So if you’re thinking about buying your first pair or upgrading your old “shoes” keep reading: we’re going to take a look at some of the best buys on the market today and cover some tips that may make your winter trip more enjoyable. 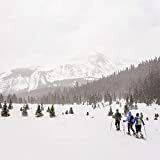 Whether you choose to rock old school snowshoes or outfit yourself with something more modern, a good foundation of proper clothing and fitness is essential for having a great time in the snow covered backcountry. Anyone who’s been cross-country skiing or snowshoeing will tell you, you’re going to get warm very quickly. As well, having restrictive, unsecured or otherwise uncomfortable clothing will ruin your fun. Layering your clothing is the best approach for staying warm, but not overheating in the cold. This is especially true when you could be standing still some of the time and practically running up hill in your snowshoes. I like to have a good set of silk weight or lightweight polypropylene “long-johns”. 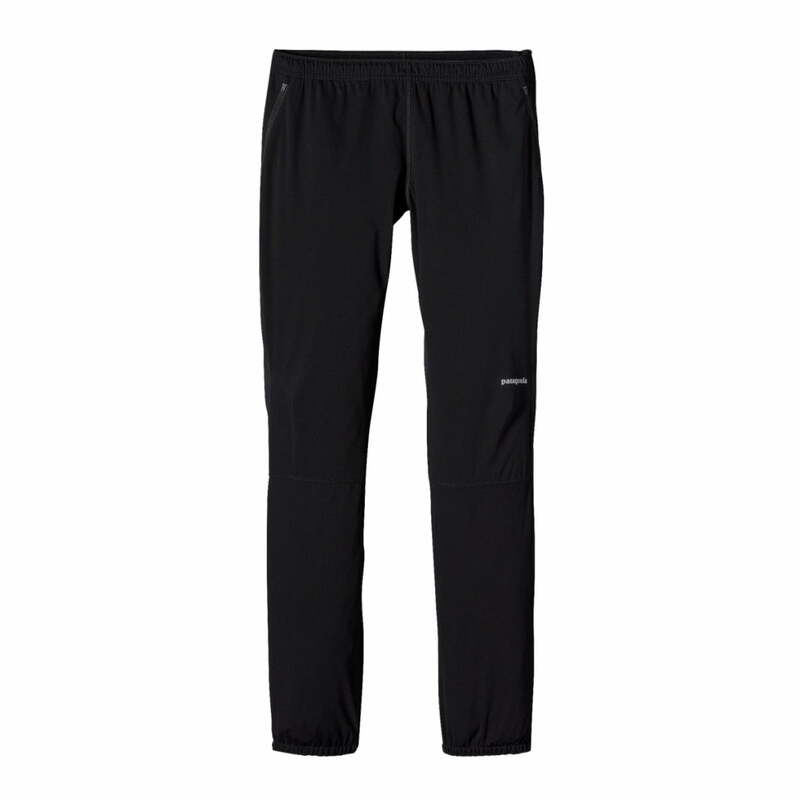 For the weight, synthetic material long-johns have incredible warmth retaining properties for when you’re less active. On the other hand, the synthetic material also wicks away perspiration in a very efficient manner. Sometimes I get so warm trekking on my shoes that I wish I could just get away with wearing my base layer and nothing else (regardless of ambient temps). For pants and shirt, I recommend a strong material that’s mostly water and wind resistant. Again, it will probably be a synthetic material and more than likely it will cost more than a few dollars. Brands like Arc’teryx and Patagonia make excellent pants, shirts and light jackets for winter and wet weather activities. If budget is a concern, insulated wind-pants and light wool flannel shirts works well. 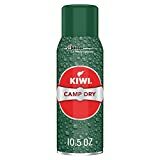 You can always take a can of Camp-Dry to your outer wind-pants days before your snowshoeing adventure and achieve decent enough water repellency. I always have a small pack or a pull behind sled, so I can throw a winter parka in my kit. The reality is that although I always have my parka with me, I rarely am wearing it for very long when snowshoeing or cross country skiing. The picture at the top of the article was taken in northern Michigan in 2013 at the beginning trek of an advanced level winter survival course that was just ahead of impending “white-out” conditions. The temps during the day were +5F and right around -10F at night. The sustained 25 MPH wind with gusts up to 40 MPH made it a tad colder. And why does any of this matter? Well, even with it being as cold as it was, I was drenched with sweat at the end of 2 miles through back country on snowshoes and I was only wearing a thin base layer, pants, shirt, light cloves and a light skull-cap. If you’re out on snowshoes, you may not be covering ground like I was trying outrun a winter storm, but you’re probably going to sweat anyway. If you layer your clothing and have a small place like a pack to stow jettisoned garments, you’ll be able to manage your body temperature a lot easier. One of the biggest mistakes one can make with snowshoes is trying to secure clunky, heavy pack-boots to snowshoe bindings. Even if your pack boots “fit” the bindings, the user is going to sweat something fierce in the matter of a half-mile. I like using a good lightly insulated hiking boot. They give excellent ankle support and make sure you’re getting all of the performance from your snowshoe that you should be getting. I’ve seen more than a few people have trouble on snowshoes, blame the snowshoes themselves, when in reality it might have been poor footwear selection that caused improper fit and subsequent tripping and tangling up on the trail. If you do a lot of winter camping and need warmer footwear when you’re not so active at your destination, I’d throw your pack boots in your pull behind sled or in your pack. I keep a good pack of “below zero” pack boots in my sled. I find that I’m definitely warm enough with a good hiking boot and wool sock. One of the reasons I don’t mind using hiking boots in deep snow is that I like to wear snow gaiters. Not only are they inexpensive (the one’s picture below can be had for under $20), but they are very effective in keeping out snow and water, they aren’t bulky and when you’re done with them, they fold up and go right into a cargo pocket or backpack. I learned the value of a good set of snow gaiters on my first long winter camping excursion. Everything from my knees down would be soaked after each trek. That can really be a problem in extreme temperatures. Basically anything that gets snow clung to will eventually become soaked and need to be dried. To help combat the constant need to dry-out while winter camping, I just throw on a pair of snow gaiters. What about waterproof pants? I like those too, but the snow gaiters keep powder out from the lip of the boot and the tops of the laces. Regardless of the pants I wear while snowshoeing, a good pair of snow gaiters are absolutely necessary. 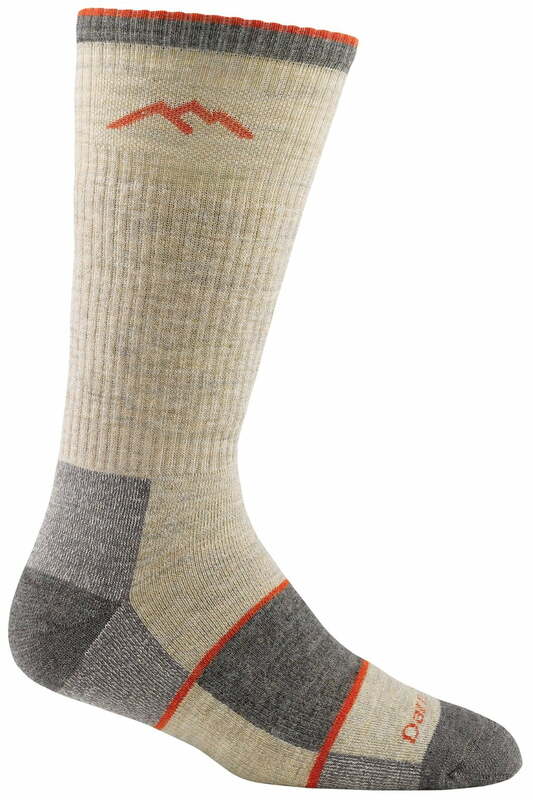 Hikers, military veterans, hunters and many other outdoorsmen know that good quality socks are not to be taken for granted. We spend how much money every few years on quality shoes and boots, why should wrap our feet in anything less than a top-shelf product? My biggest concern when snowshoeing or hiking is blisters on the foot. The more weight or resistance you encounter, the more of a problem blisters become. That’s why I like quality brand socks, because I’ve found they really mitigate the forming of “hot-spots” on the foot. There are plenty of good brands of socks on the market, (like my favorite Vermont brand), but as long as your sock wicks moisture and helps protect against unwanted friction, you’ll be enjoying your hop through the snow, I’m sure. One piece of gear that’s possibly forgotten on the first snowshoe trek, but never again is a good set of snowshoe poles. Snowshoe poles are worth their weight in gold. Not only do they help you balance and thus keep you from eating snow by planting face first, but I was surprised how much more energy I had at the end of a trek using snowshoe poles, versus the times when I didn’t. I don’t think I’d spend any more than $75.00 on a pair of poles. There are many options out there. But one thing is for sure, you won’t be sorry for grabbing a pair of snowshoe poles to better secure your balance. Pictured Above: The author with Tubbs snowshoe poles in a remote northern camp site. 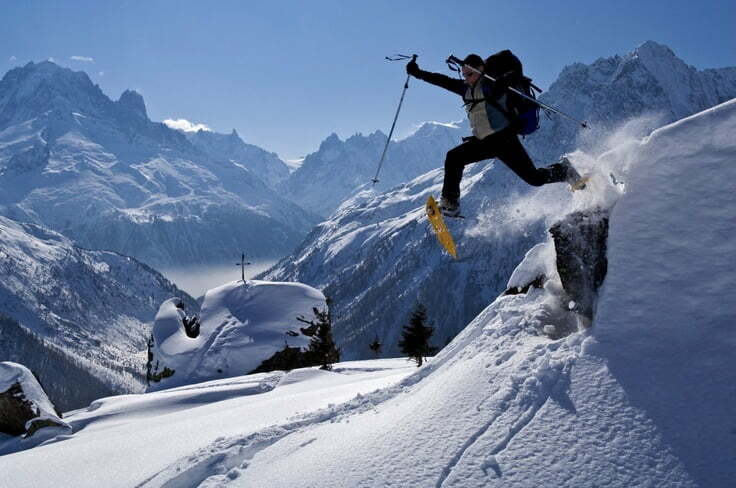 If you’re going to be doing snowshoeing like the guy pictured above you’ll have to be in top physical condition. But even if you do a less “aggressive” style of snowshoeing, being in the best physical condition you can be is a huge plus. For starters you’ll be able to go much further and still enjoy your tromp through the snow. Another benefit of being physically fit before you hit the trail is that you can really get the most out of your snowshoes. If you’re new to snowshoeing it’s important to know if it’s your technique causing the problem, or it’s the lack of physical conditioning. Another benefit of good leg strength and balance is that it aids in evaluating the function of the new set of shoes when they come in from Amazon. I recommend doing squats with no weight every other day as your outdoor adventure approaches. While squats will build strength and balance, going for a long walk after work will help build stamina. 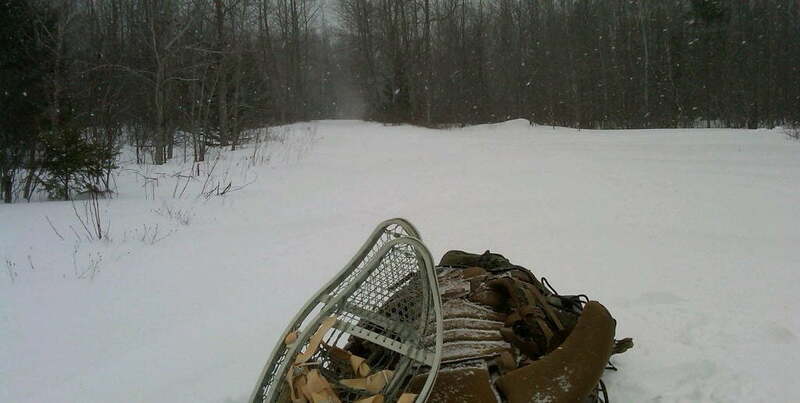 When I get on snowshoes, I’m generally going for a couple miles at a time and pulling a 100 lb. sled behind me. In order to train for such a trek, I make sure I do several miles every other day on the elliptical machine, and do plenty of squats and other body weight training exercises. Without a doubt, the more physically fit I am, the better time I have on the trail. If you’ve never been on snowshoes before you may not be aware that the designs have changed a bit from the vintage style ones pictured above. You can surely still buy snowshoes like this online, mostly from Ebay and Amazon, and you’ll probably notice that their construction is more “organic”. Old-school snowshoes are constructed largely of wood, leather and raw-hide. Because snowshoes have been around for centuries upon centuries it only makes sense that they were constructed with natural materials. While they tend to be a bit heavier than modern industrialized snowshoes, they are still very effective at keeping you on top of deep, deep snow. The bigger snowshoes seem to help keep one buoyant on deep snow much better than compact shoes. Vintage snowshoes like the ones pictured above, and the Canadian Commercial Corp. magnesium snowshoes are some of the bigger models you’ll see today. In fact you can still get magnesium snowshoes on EBay and Amazon today. You can probably snag a new pair and bindings for under $150.00. 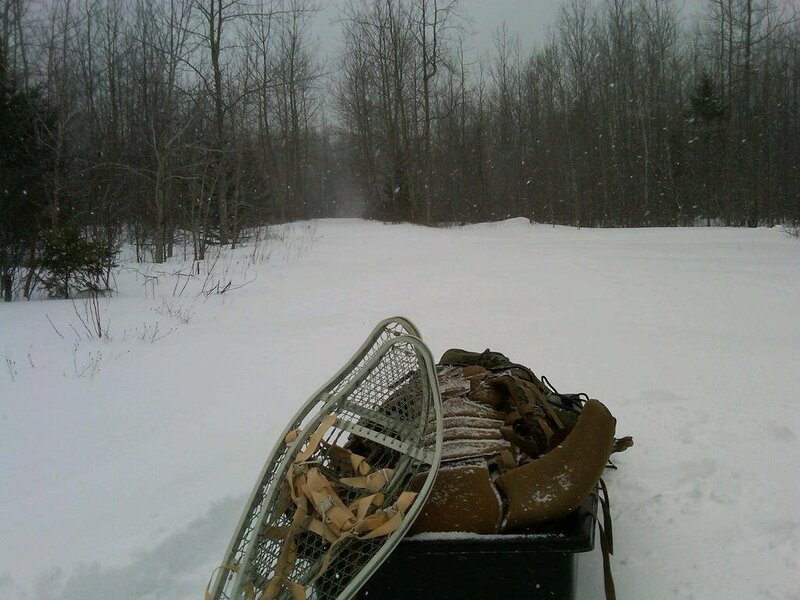 Believe it or not, I use the old style snowshoes for deep snow treks, especially where I know I’ll be breaking trail. As you’ll see further into this article, snowshoes like this are not the most compact, nor are they best suited for maneuvering in any other fashion than forward direction. 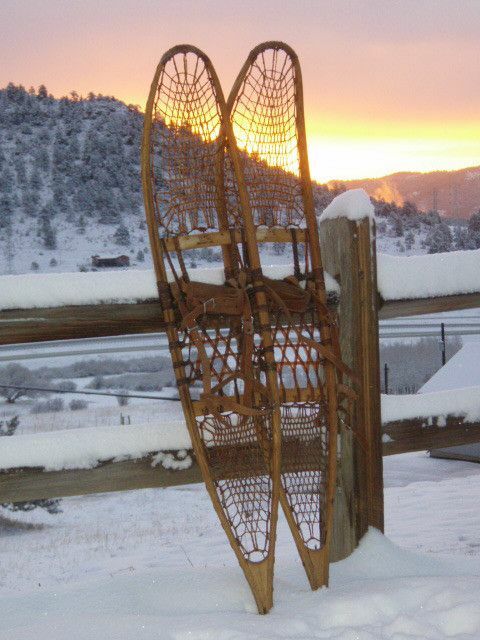 Are vintage snowshoes for you? Pros: Long and, or wide vintage snowshoes will keep you standing on top of 6 ft. deep, powdered snow like nothing else. If you’re a big, heavy person, or carrying a heavy pack, long snowshoes like the Canadian brand pictured above are not a bad choice. Just like hunting with an old fashioned muzzle-loader musket, there’s a certain nostalgia that comes with vintage snowshoes. Also if you see magnesium snowshoes for sale online, that they can be “used” to start a survival fire, which is true, however it takes quite a while to make enough magnesium shavings to start a fire, (and you’ll still need a sparking device, tinder and kindling). Vintage magnesium or wooden snowshoes aren’t all that bad, I kind of like mine. But there’s a few things to keep in mind . . .
Cons: Most vintage snowshoes are made from relatively lightweight hardwood, and the magnesium snowshoes are also made from relatively lightweight metal too. 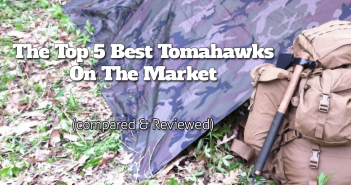 But as lightweight as these old-school models are, they are still heavier than the newest models we’ll be reviewing. If you’re in good shape, you won’t notice the extra weight, but after several days of snowshoeing in a vintage military pair of snowshoes like the ones pictured above, you will be sore. Ask me how I know. Maneuverability becomes an issue with long vintage shoes as well. If you find yourself in hilly terrain or you trek into dense woods, you may have a constant tripping problem. 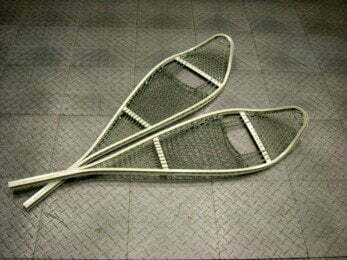 My recommendation: If you have the money, I’d make a vintage pair of snowshoes my second pair, meant for open terrain when snow of more than 2 ft. deep. If I were a big guy over 6’2”, and over 225 lbs. then I might make long, vintage snowshoes my first pick, however there are still long model snowshoes for bigger stature folks, on the market, so not to worry. Otherwise, my first pick for snowshoes is something more compact, designed from lighter more industrialized materials. Listed below are some of the best snowshoes on the market. These products have been evaluated and shown to have a great balance between function, cost and availability to the general public. The first time I saw a pair of Northern Lites, I had to try them on. I was out on a winter survival course and one of the party members had shown up with these bad boys. I was surprised at how easy they were to put on and how maneuverable they were. Northern Lites makes several different grades of snowshoes that might fit your exact needs. The “Quick Silver 30” is out of the recreational grade snowshoes. The frame is made from aircraft grade aluminum (which is generally lightweight). The decking is made from MIL-standard polyurethane nylon, and is not only very strong, but it keeps from cracking and tearing under much weight and extreme cold temperatures. These snowshoes measure in at 30” by 9” wide, which is great for maneuverability, but long enough to be buoyant on top of deep snow. At 49 oz. per pair, you’ll be happy with the weight you aren’t carrying on the Quicksilver 30 several miles down the trail. You can have a pair of the coveted Northern Lites Quicksilver 30 for under $170.00. Pros: If you’re looking for a trusted brand name in snowshoes that has a good warranty and customer service, you could do much worse. If you get out on the trail one or two times a year, these durable snowshoes offer an affordable option for top-shelf quality. Cons: When it comes to Northern Lites, there are few “cons” to consider. If I had anything to say about this model, is that the recreational Quicksilver 30’s are only rated over 175 lbs. If you’re a heavy person, or you’re carrying a pack in addition to your natural body weight, you may need something rated for more weight in deep snow. If you’re concerned about uneven terrain and even getting up the side of a mountain, you might check out the MSR Revo series snowshoes. 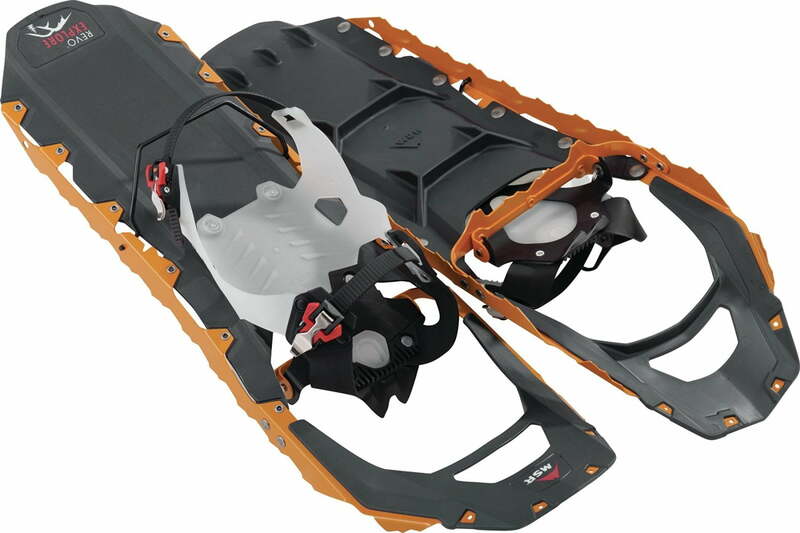 For under $225, you can get these highly maneuverable, aggressive looking snowshoes with effective crampons. One of the problems with traditional snowshoes is that they don’t transition well for crossing ice patches. One ends up slipping and sliding a bit. But that’s not the case with the MSR Revo Explore snowshoes. You have crampon surface that runs almost the entire length of the snowshoe, which means you’ll get superior traction on ice with these puppies. You can chose from two sizes: 22” and 25”. Right off the bat, I would go with the 25” model to extend my buoyance in deep snow. While you’re at it you might purchase the tail extender for an extra 5” of length, (pictured below). You can add these to your kit for under $60.00 if you buy them from Amazon. Pros: If you’re going up and down rough terrain, over ice covered ponds and lakes, and need a high degree of maneuverability, these snowshoes wouldn’t be a bad pick. I like that extendable snowshoe tails are available, so that if you need them shorter, you can take the tails off and if you’re heading into deep snow you can snap the extensions on. 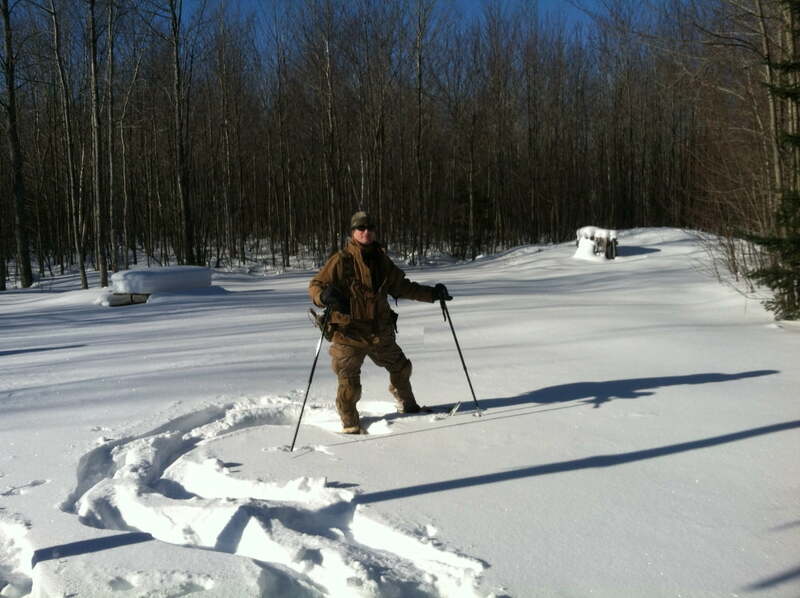 It’s no wonder MSR has supplied snowshoes to the U.S. military’s mountain division. 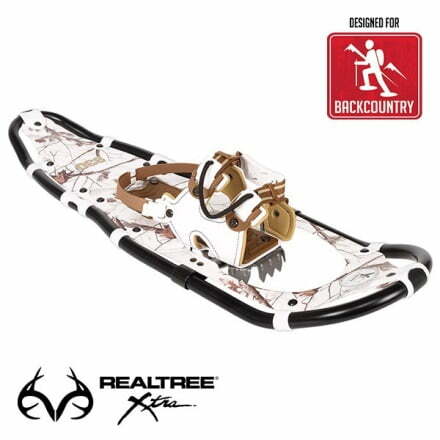 Cons: The one thing that I wish MSR would do is include the tail extensions with the snowshoes one does not have to spend extra money to get a full 30” length out of the product. At under $225.00 these are still a great value, but adding another $50.00 on to the bottom line makes them a little pricey at that point. 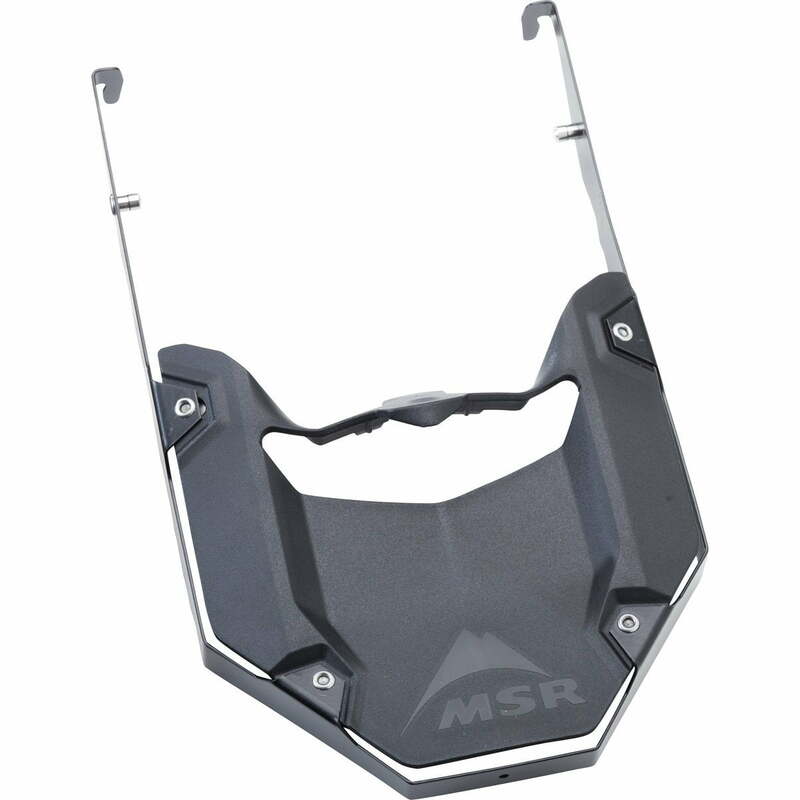 MSR still makes a durable product and you’ll get a lot of use out of these snowshoes should you pick this model. Bigfoot brand out of Canada makes one of the most affordable, but still durable snowshoe series. The Adventure series has everything from 15” snowshoes for kids up to 36” snowshoes for large stature adults. The 34” model weighs in at 6.2 lbs. and is 9” by 34” in length. While there are lighter brands on the market, these aren’t exactly heavy. Their decking stays pliable down to -40 F, which means it will resist breaking and cracking. What’s nice about the large snowshoes is that they’re rated for folks ranging from 250 lbs. to 350 lbs. This means that even if you’re a guy that weighs in at 225 lbs., you can still get away with carrying a pack for your winter adventure and you you’ll stay on top of the powder. Pros: The vast majority of folks are on a fixed budget, but still need a good product. I love when companies put out a well-made product like this that a whole family can realistically purchase and get out to enjoy winter. 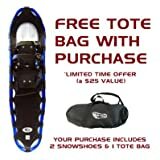 Bigfoot routinely puts deals on Ebay for family snowshoe packages under $350! That’s awesome. Outfit the kids and spouse, and have some winter fun. Cons: These are affordable snowshoes, but they’re still designed for recreation and not for hard use, such as mountaineering or search and rescue. You may not need snowshoes for serious use though, and if that’s the case there are little or no cons if you go with the Bigfoot Adventure series. Here’s yet another durable and effective snowshoe from a reputable manufacturer. For under $225, you can purchase the Tubbs Wilderness Snowshoe. They come in sizes 25”, 30” and 36”. They range in weight from 4.5 lbs. to 5.7 lbs. These definitely light-weight enough to wear all day and not feel exhausted from use. Take a look at the video below. These snowshoes even come with a bar that pops up to help mitigate calf-strain during long ascents up hills or mountains. Pros: The bindings on the Wilderness Snowshoe seem to go on very easily. The pop-up bar that reduces calf-strain on up-hill climbs sets this snowshoe apart from other brands and models. 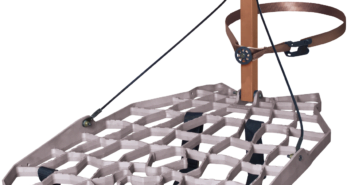 I also like that you can buy the Wilderness Snowshoe model in several different sizes. 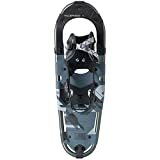 Cons: Although these snowshoes are unique, lightweight, and have great crampons, I wish they had a bit better price point. Tubbs is definitely a popular brand, and they aren’t unreasonably expensive at under $225.00 for this model, but they probably could edge out a lot of competition if they came in under $175.00 for the Wilderness Snowshoe model. At any rate, you will probably be very happy with the durability, ease of getting them on and off, and overall performance you find with Tubbs snowshoes. Yukon Charlies hits the bulls-eye with their Realtree Xtra model snowshoes. For hunters that experience deep snow, these are a great buy. They come in both Realtree Xtra and Realtree Xtra Snow, which is pictured above. For under $180.00 this is a really durable set of snowshoes with a few really cool features. 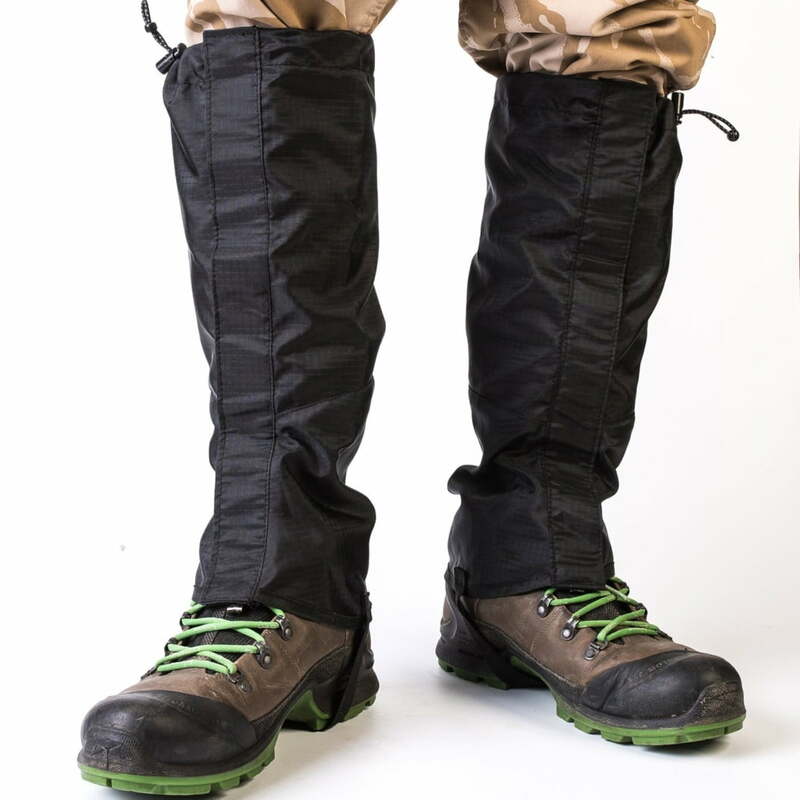 The first is the pop-up calf-support which is also seen on the Tubbs Wilderness snowshoe. In addition to that feature Yukon Charlies has also included an easy-on binding that one pulls to tighten, and pulls the opposite direct to pull off. The 9” x 30” model supports up to 250 lbs. and weighs 4.9 lbs. This is one of the more lightweight snowshoes given the size of the frame. The decking is made from durable tech weave. 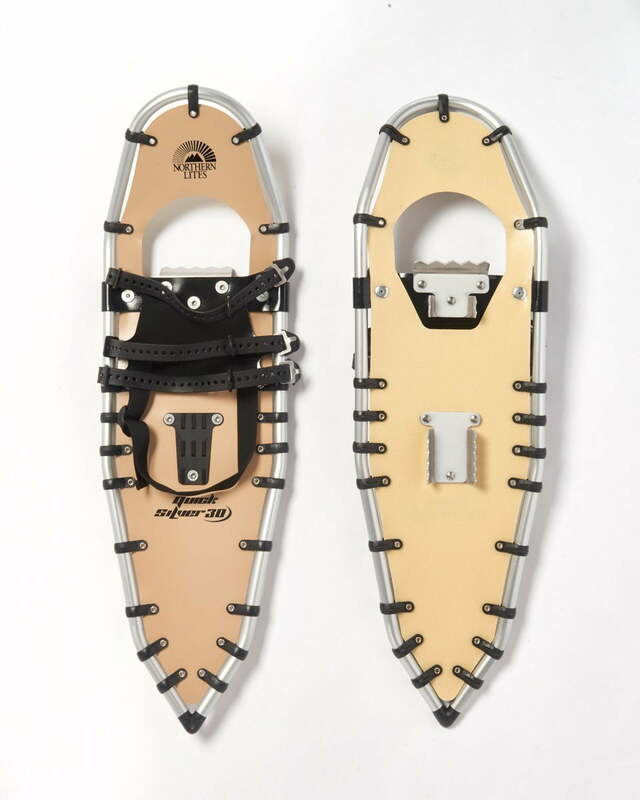 You can choose from 36”, 30”, 25” and 21” snowshoes depending on your needs for weight and size. If you’re covering ground in back-country, whether you’re a hunter or just an adventure seeker, you won’t go wrong with these. Pros: The Yukon Charlies Realtree Xtra is probably my favorite modern snowshoes. The binding system really has me sold. When I’m in winter camp and have to venture to get firewood, I value a product that makes getting in and out of my snowshoes much easier. The price point of under $180.00 is affordable for the features and durability that you get with the Realtree Xtra model. Cons: There are few if any. Yukon Charlies seems to offer the best of both worlds to the consumer between quality and cost. 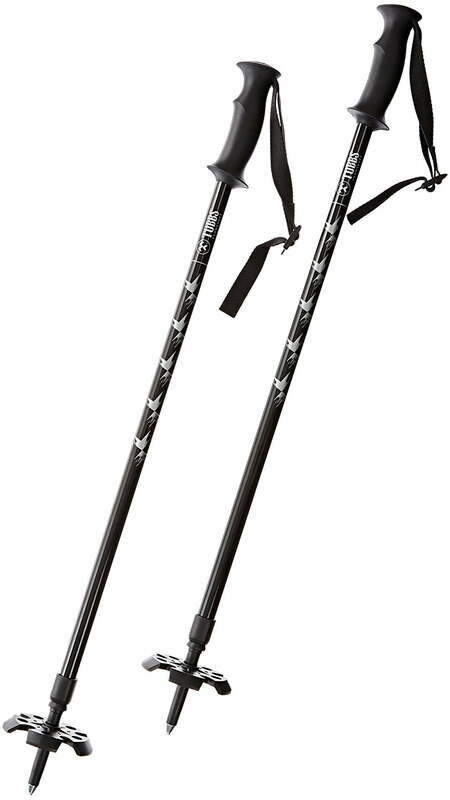 If they really wanted to sweeten the deal, a carrying case and a set of poles wouldn’t be a bad bundle to offer as a snowshoe kit. 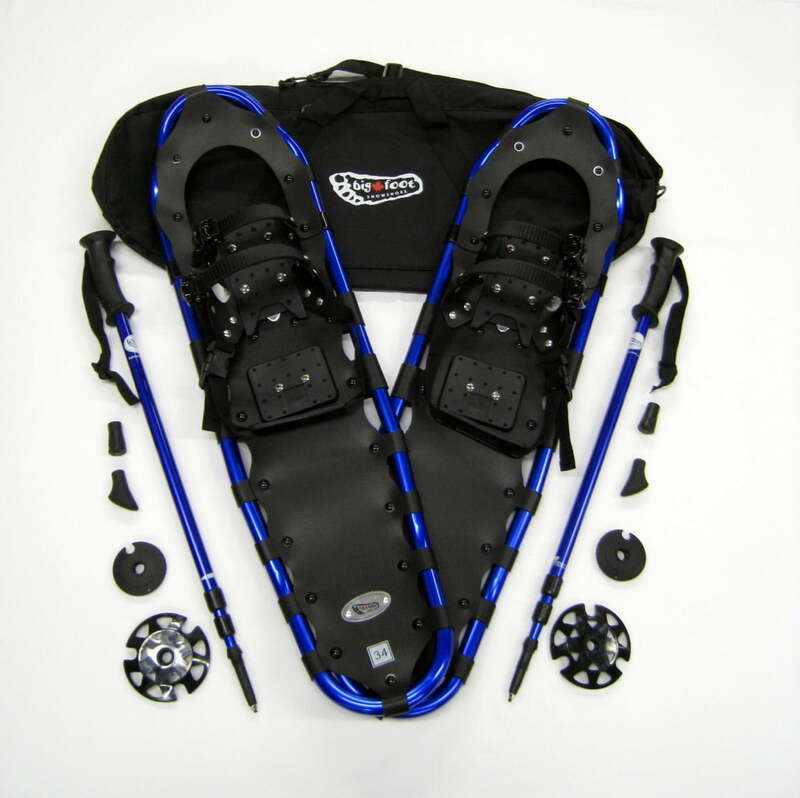 If you’re new to snowshoeing, Alps is an affordable and reliable manufacturer. I’ve seen lots of folks use this brand. For under $100, Alps brand makes a 25” All-Terrain model. They are constructed with fast-loc buckles and the frame is from standard 6000 series aluminum, so you know they are lightweight. In fact, a pair of 25” snowshoes weighs under 4.5 lbs. At 25” by 9” wide, you won’t have to worry about getting tangled and tripping as much longer models. 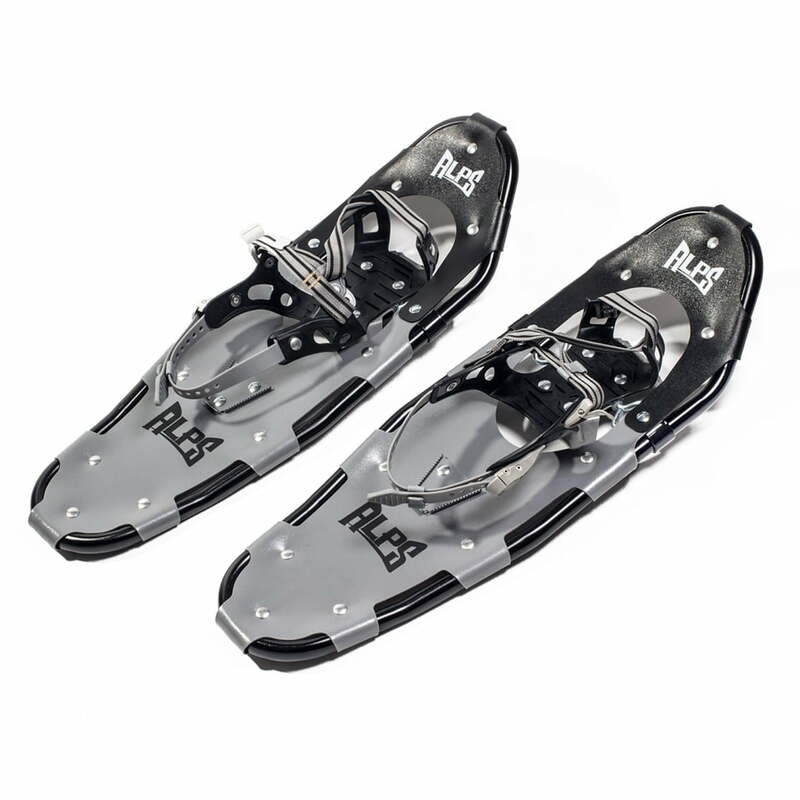 These are great for folks who are getting acclimated to the idea of snowshoeing. They are inexpensive enough that if you decide you really like snowshoeing you can afford a higher end pair without crying too much about having purchased this pair first. The decks are riveted and made out of Nytex (a durable nylon material). Pros: Did I mention these snowshoes are affordable? They come with a free tote to keep the dust off of them when they’re stowed. They are well constructed and support the appropriate amount of weight depending on the length of shoe you decide to go with. 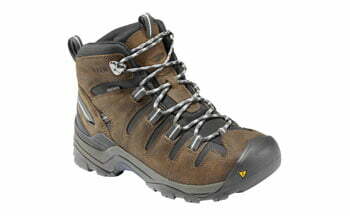 The 25” All-Terrain shoes support 150-200 lbs., which is probably adequate for most recreational trail use. Cons: Alps makes a pretty good introductory model for beginners, but these aren’t as durable as the MSR, Northern Lites or Yukon Charlies. They are durable enough for recreational use, so this isn’t really a “con” per-say. 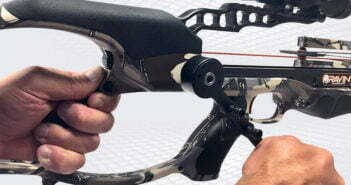 I do wish the bindings were a little more user friendly like those on the Yukon Charlie Realtree Xtra. There are features that other more expensive brands have that the All-Terrain model doesn’t, but one has to remember that these are beginner snowshoes and are very affordable for someone who’s not as committed to this outdoor sport. When picking out a good pair of snowshoes, it’s important to consider how often you’ll be using them versus how much money you realistically have to spend. It makes no sense to purchase $500.00 snowshoes that only get used once every other year. Conversely it doesn’t make any sense to buy “knock-off” snowshoes that will break when you’re 5 miles into the wilderness. Luckily, there are many “best-value” options on the market so you don’t have to spend a fortune or buy an inferior product. Modern snowshoes have been engineered to be more cost effective and user friendly than the vintage snowshoes of yesterday. While I’ll probably never get rid of my vintage military snowshoes, I appreciate lighter, very durable modern snowshoes like the ones reviewed in this article. It’s important to shop around and compare the options that are available on the market. You may have a family of winter warriors to outfit, so cost may be more important to you than other individuals, but there ARE great deals like the Bigfoot Adventure series, so almost everyone can afford to have some fun this winter. As long as you remember to dress correctly for the sport of snowshoeing and keep in good physical condition before you hit the trail, I’m sure whichever model you decide to go with, you’ll have a great time. Stay warm on the trail, (but not too warm).